Campaigners have thanked the Welsh Government’s Health Secretary after ‘positive talks’ about a new facility for Cefn Mawr. Vaughan Gething visited the current Caritas Surgery on Well Street on Friday morning (April 20) after an invitation from local Assembly Member Ken Skates. Clwyd South AM Mr Skates had previously organised a petition – signed by more than 2,000 people – which called on Betsi Cadwaladr University Health Board to bring forward plans for a brand new building ‘fit for the 21st century’ as soon as possible. 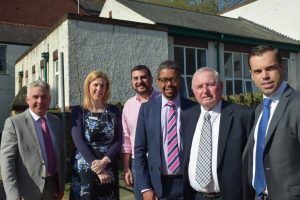 Mr Skates was joined by local councillors Derek Wright and Ken Bathers, who also showed Mr Gething their two favoured spots for a new health centre – the former Co-op site and the Wrexham Council-owned Wheatsheaf Workshops building on High Street. BCUHB funded urgent work to improve the current surgery in 2016 after agreeing it was ‘not adequate’ and said it would also develop a plan for more modern premises.